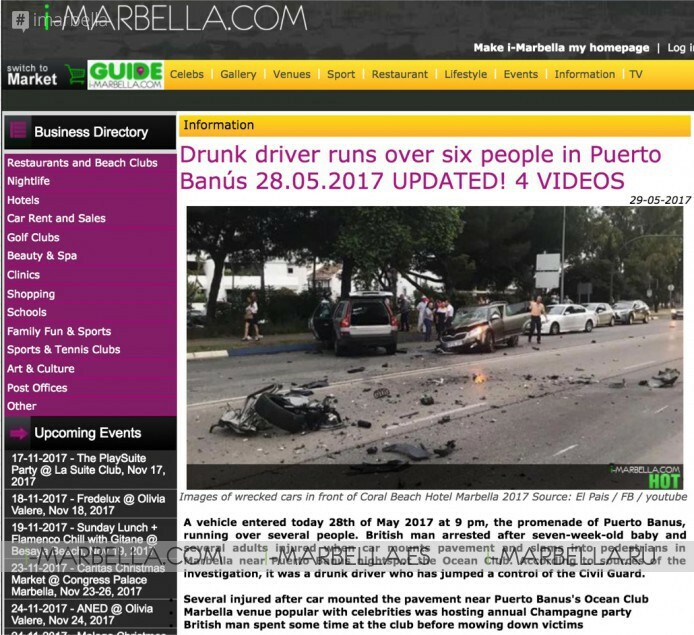 These are the most viewed stories of I-Marbella's 2017!!! As you know, 2017 was a really busy year, a lot has happened and your opinion is as always what matters the most. So, we dedicate this article to show you the most popular stories and galleries of 2017, we hope you enjoy. Shocking!!! Viewed over 60 000 times and the biggest tragedy of 2017, a British 22-year old man rushed over a sidewalk ramming over 6 people and then causing a car crash which brought 5 more victims to its count while fleeing the scene. At the beginning of the high season, Puente Romano Beach Resort and Spa added a new proposal to go have a drink and party with your friends, an extended La Suite Club outdoor- 'La Terrasse', a new that raised up with more than 45000 visits! With over 40 000 views our businesswoman Annika Urm who travels all over the world to bring you the latest and hottest news spent some time in Asia during December 2016 and January 2017 and celebrated New Year in Singapore. Annika is the most popular freelance blogger, with her own media company and a lot of followers all over the world. Olivia Valere is always in our top 20 of the year! Karen Valere Birthday Party was designed and planned by her showing off her ability to create unique and joyful environments for celebration. 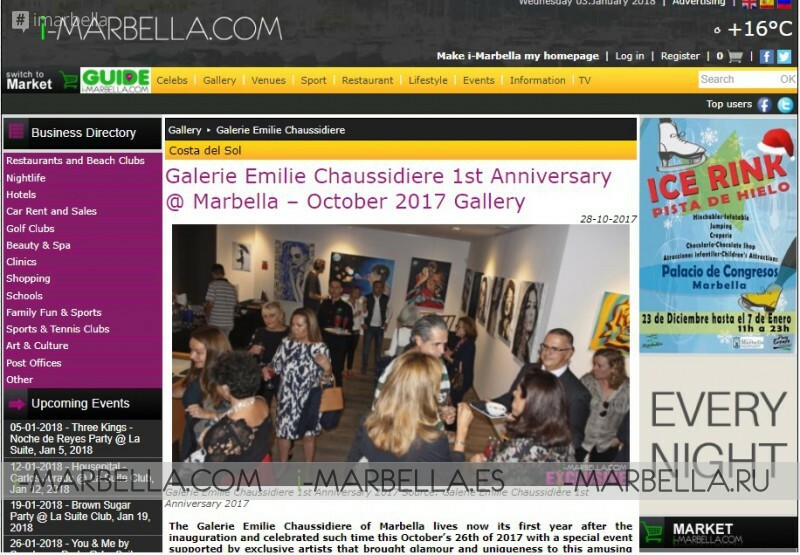 The 5th entry in our list is taken by the Galerie Emilie Chaussidiere of Marbella which celebrated its first year after the inauguration this October’s 26th of 2017 with a special event supported by exclusive artists that brought glamour and uniqueness creating an amusing evening. Olivia Valere club stays on top! 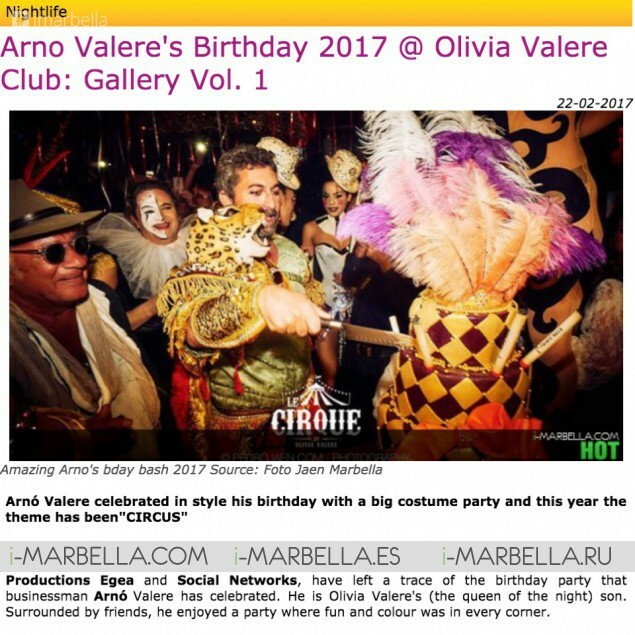 The brother of Karen Valere and Son of Olivia Valere, Arno has a very special birthday party every year, this year launching a huge “Circus” themed costume party on February which drowns a lot of attention from our readers. Three Valleys, Méribel Montarret, is located in the Savoy region of the French Alpes, the Three Valleys ski area offers more than 600km of ski slopes shared by 8 ski resorts and our Star Blogger Annika Urm gave us insights of her experience about her instance in this white-snow paradise. World Vision is the world’s largest international children’s charity, working to bring real hope to millions of children in the world’s hardest places and Puente Romano had the pleasure to host its Gala Dinner 5th edition on Thursday 17th August 2017 in the breathtakingly seafront restaurant Sea Grill raising, not only funds for this noble cause, but up to 30000 views. This Charity Gala was chosen by the heritage owner of the Puente Romano Daniel Shamoon personally aiming to help World Vision to get further in their mission to help the children. Legendary Ibiza Beach Club finally opened its doors in Puente Romano Marbella with an amazing party where the guests enjoyed a first class place, a lot of fun and an and unforgettable time on this new outdoorsy venue. Darkness within the guests showed up as the monsters took over La Suite Club of Marbella during Halloween night party that took place during October’s 28th of 2017. All the attendants showed up in their spookiest costumes letting the wonders of Halloween take over the place and leaving a gallery filled with spooks and horrors of all kinds with an exposure of more than 25000 views! 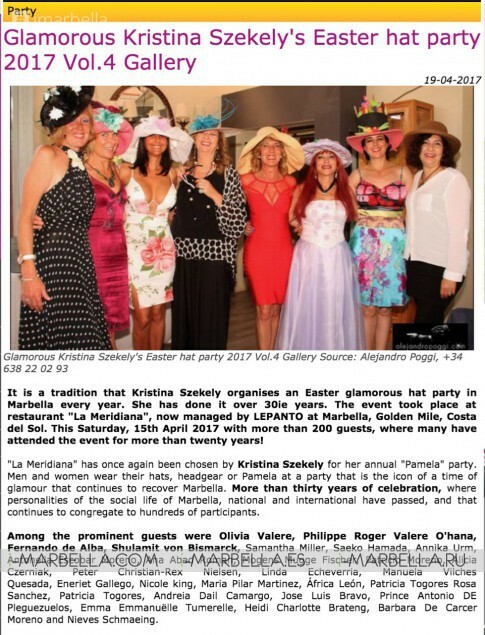 It is a tradition that Kristina Szekely organises an Easter glamorous hat party in Marbella every year and this has been so for over 30 years. This 2017, the event took place at restaurant "La Meridiana", at Marbella, on Saturday, April with more than 200 guests, many of them who have attended the event for more than twenty years! The party was amazingly fun and wrapped in good energy generated by hostess Kristina Szekely, starting with a traditional cocktail, followed by lunch, a contest of Pamela's where awards were given to the more original designs of Pamela and hats and extended until night with music, dancing, laughter and good vibes. Finca Besaya was blown away by the incredible talent and voice of Yanela! She sang 2 of her songs and set the party on fire! This fabulous Cuban DIVA started singing unexpectedly when Annika Urm passed her the microphone during the MUMM party at Finca Besaya early this year. A new Nightclub has opened in Marbella on 9th June 2017, Teatro Marbella, promising a Magical experience! Its main concept is to escape from reality, a door to a place where unbelievable things happen, a territory where you can transform and become someone else, a place you can be whoever we want! Therefore they offer a new atmosphere where the staff service, artists and DJ’s energy will ensure all guests to have an unforgettable experience. Irish-Italian designer Virginia Macari celebrated her fourth launch of a Beachwear Couture summer collection 2017, "The Paradise Collection" at Puente Romano Beach Resort & Spa in Marbella on 5th May of 2017. Famous guests at the launch included the stunning Miss World 2003 Rosanna Davison, DJ, and Model Vogue Williams, the UK Top Model Roxy Horner and the who’s who of Spain’s most cream de la cream models and socialites. During this Great Gala the book "LOS 100 INTERNACIONAL" Marbella Te Quiero!!! By Oscar Horacio Holtzheker Fernandez was presented and some of the most wonderful personalities of Marbella and other World fabulous cities were awarded. Before dinner, a fashion show took place, showing garments of the Great Designer Patricia Nahmad and the great singer Frank Camelot delighted the crowd with his incredible voice. Founder and host Maria Bravo gathered personalities and influencers from around the world of theatre, music, sport, and philanthropy in a gala full of emotion. Foundation, were the winners of the evening, in recognition of their social work while gathering funds for other three magnificent foundations. Coastfield Projects presented Elisabetta Franchi Fashion show lunch by ALTA MODA at Puerto Banus. This incredible FASHION Lunch was organised by amazing Kenza E. Carlson y Saeko Hamada, who, as always, managed to offer a dreamy and elegant event! Supermodels Tiara Tian and Sally Sanchez were there as well as Asma Amrani the Famous Blogger from Morocco at Sea Grill Puente Romano and our gallery raised still more than 20000 views to fit in our top 20 of this year. Our Amazing Blogger and Businesswoman take another piece of this top as she spent the Saturday, April 15th, 2017 in FOOD ROOM among people who share the love of both food and cooking, to receive a nice cooking lesson. “This class was such extraordinary and pleasant experience! I've spent Saturday night in Marbella learning how to cook, eating and communicating with amazing people in a lovely ambiance. It is the best way to spend your time and money for quality dinner, fine liquor and socializing”. Cooking course was Mediterranean Cuisine in Spanish and the star chef of the night was Manu Balanzino who shared some 5-star recipes. Sunday 16th, April 2017 was all about fun Easter celebration at the incredible facilities of Besaya Beach, Marbella, taking the Easter Celebration to a whole new dimension! With live entertainment all day long! Including music with Eric Michel Duval, DJ Victor Garcia, and Ruben Hidalgo Violin Live. The incredible performance of dancers left everyone attending breathless but you can see that in our gallery here. Finca Besaya is recognized as the ultimate 3D place! Dine, Drink and Dance, and this is not a free name. On April 28th they hosted another outstanding Marbella weekend named “Let's party” which assistance and after party popularity was amazing! Amazing galleries, tragic stories, and a lot of good moments were given to us this 2017, here we thank you for following us and making this possible and we promise to keep bringing to you the most amazing news and insights on all the events that come through our beautiful city of Marbella under the lead of Annika Urm and by the hand of all our team.